So a journey that began at the beginning of this year has come to an end. Six months of gruelling hard work. At the start there were four of us… by the end, only two remained (One is off on paternity leave with his first child and the other ran off to Hong Kong in pursuit of his girlfriend!). 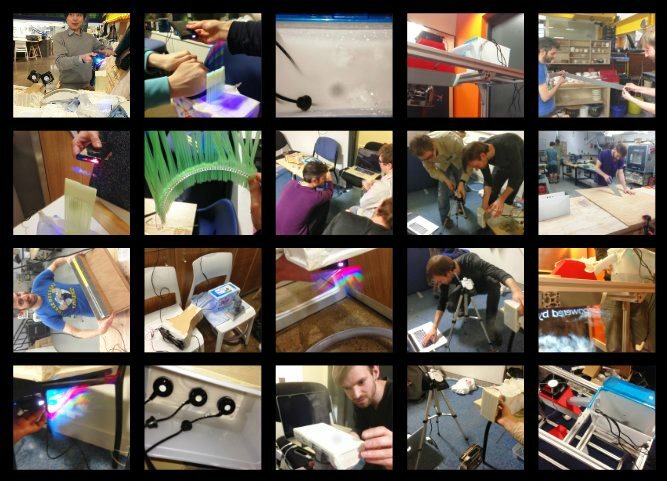 The last month has been hectic – prototyping, supplier delays, user testing, open day demostrations, more prototyping, report writing…. But at long last it is there! Last week we presented our final presentations to the VEIV supervisors. Our own supervisor was the VEIV superstar, Anthony Steed. For those who don’t know him, he is the big dog in computer graphics and has the largest collection of cool gadgets and toys a grown man should be allowed… yet it’s part of his job! The man has a million and one ideas in his head but only 24 hours so he kindly threw the idea of a fog projector to us at the beginning of this year. We set up our apparatus and were third to present. The 3D printing group presented brilliantly, with their “just-in-time” buffer control which is quite interesting. The second group on architecture was very convoluted and confusing, but seems like they did lots of work. They had littered their work with Processing graphs which looks gorgeous but meant very little. Our turn. Not as slick as the 3D printer guys, but full of enthusiasm. We felt like the kid on sports day that doesn’t get a prize for coming first, but for making the most effort in running 50m. We kept the presentation light and frothy, interspersed with light banter and the occasional joke. The audience were intrigued but were not convinced until… DEMO TIME. Boom. Lights off. Fog on. Instantly the room understood what we have been up to for the past 6 months. We had set up the projection angle to go diagonally across the room for the best effect and demoed a flickering fire, a baby video (for its high contrast) and the night & day short from pixar. Here is a short video showing our 3D views working…. More chat, demo 2! This time we demonstrated the leap motion controller. The Stanford bunny did us proud by not skewing or flipping randomly. Drew’s implementation for the hand gestures had worked like a charm. And with that, comes an end to another group project! Well not quite, we had to finish the report (12k+ words!) to hand in on Friday but that was more or less there anyway. We’re planning to make our designs open source (and also electrically safe enough to demo!) and hopefully submit a paper for CHI later this year so look out for that!